This item includes a zipped download of ALL TWELVE of the hat projects in Series 2. Price if purchased separately would be 96.00, so if you buy by the set, its like getting one pattern free! Download is in PDF format. 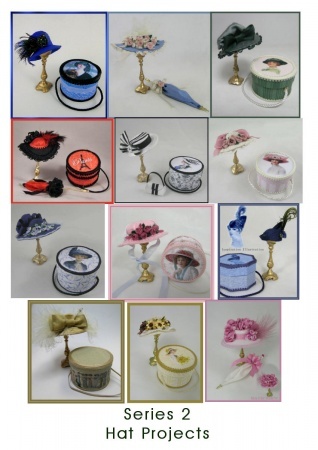 It contains complete instructions with dozens of photos, full size pattern pieces for the hats, and parasols, purses, and hatboxes in each project as well as full color artwork for the hatboxes.